Whilst there are several car crash repair invoice finance companies, that will handle invoices to car insurance companies, not all of them will handle "self insured" invoices, or invoices to accident management companies (third parties that deal with accidents). 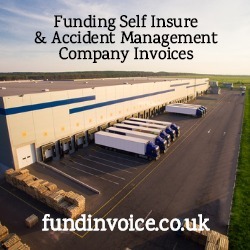 "Self insure" and accident management company (AMC) claims are also able to be funded, under an invoice finance arrangement, by our bodyshop funding partners. Typically these kinds of invoices arise in the following circumstances. Self insure invoices occur in the case of some large organisations such as the NHS or say a large haulage firm. If their vehicles are involved in an accident, and the cost of the repair is below the insurance excess of the large organisation, they may choose to pay for the repair themselves, rather than via the insurer. Typically the excess could be to be be between £5,000 and £10,000 in some cases, so these could still be significant jobs. In such cases, the large organisation may choose not to make a claim on their insurance, instead settling the repair from their own funds. From the perspective of the garage that handles the repair, this can create a delay in receiving payment. Once they have completed the crash repair, the body shop will raise the invoice, and it could take 60 days or more to receive settlement from the end debtor. This creates a credit gap, during which invoice funding can improve the cash flow position of the garage. The way that the funding arrangement works, is that once the invoice is raised, and the work has been signed off by the relevant party within the organisation for which it is being undertaken, the documentation is submitted to the invoice finance company. The financier will make a prepayment of 100% of the value of the invoice, less the fee that they charge to handle the transaction. Not all bodyshop factoring companies are prepared to finance these kinds of invoices. The other kind of invoice that not all funders will finance, are those to accident management companies. These are situations where an intermediary company is handling the car crash repair, on behalf of another organisation, and they may be the end debtor in terms of the invoice being raised by the garage. As mentioned above, not all funders will accept this situation, but we have funders on our panel that will finance accident invoices raised to accident management companies.